Heavy users (who went online for 10-19 days a month) created 73% of all page views, while light users ( who went online 10 or fewer days in a month) accounted for only 6% of pages visited.The challenge for marketers, therefore, is to reach effectively that third of the audience generating only 6% of all pages, while avoiding having heavy users consume ad impressions at disproportionately high frequencies. An ad campaign of four million impressions could reach an audience at least a third larger when spread evenly over three large sites as opposed to concentrating the same-sized buy on a single site. The key implication was that a broader media buy across several sites was a more efficient way to optimize reach, and moderate frequency, than by concentrating the same number of impressions in fewer sites. The Internet is the only medium other than radio to have two prime times daily: the middle of the day (it also being the only high-engagement medium with significant access to people during the workday) and again in the evening. By concentrating ad buys to those two times of day, advertisers would again best distribute their impressions to times when the largest number of unique users were likely to see their ads. 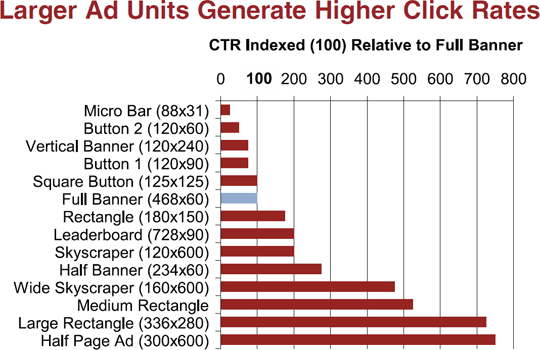 More interactive and prominent rich media units have far higher click rates than standard image ads.